Tablets are extremely popular nowadays. And game developers know it! That’s why there are so many excellent games that take full advantage of a bigger screen. Many of them can be played on iPhone as well, but the size really matters in this case – iPad lets a player immerse deeply in a game and get a really enjoyable experience. So let’s check out some of the greatest iPad games of 2016! It’s worth mentioning that all the apps below are free. Some have in-app purchases, but most don’t require any charge, so be free to download them! Let’s start our list with some of the greatest racing games. The number one is Asphalt 8: Airborne. Over two million people have chosen this game, because of its fantastic graphics and unlimited playing opportunities. Asphalt 8 is both an online and an offline game, which means you can compete with others in a real time or begin a career to master your skills and go through levels. The game boasts with its large content. A career is full of events; numerous cars can be changed in a way you like most, because of wide tuning opportunities and so on. The astonishing feature is the arcade mode, in which cars literally fly, defying the laws of gravitation! Try this one – you won’t regret it! caRRage is an unusual racing game. In this one you have to use weapons and drive old vehicles including vans and trucks. The game is very atmospheric – there are 3 amazing backgrounds: desert, industrial area and city. It can also be played both using the Internet and offline. There are 3 different modes: usual racing with weapons, delivery and battles. All vehicles are beautifully designed in retro style. Their engine and look can be improved by a player. 3D graphics in CaRRage is awesome, as well as the music that adds something special to the game’s atmosphere. This game is totally worth trying! Download it now and immerse into the crazy post-apocalyptic reality with totally mad drivers! Impulse GP is one of the most thrilling racing games. Here you are able to choose one of the nine most innovative bikes and compete with 15 other riders on breathtaking tracks. The game is offline, but you have got a chance to set up a record among your friends or players from all over the world. It’s also possible to tell someone about your achievements. There is a number of tracks and kinds of races. Each of them will certainly make adrenaline run in your veins! Electronic music and excellent graphics make the game even more impressive. The pleasant fact is that the app is absolutely ad-free. So if you want to get a thrill, get this one! Sonic & All-Stars Racing Transformed is another great racing game. You can play as Sonic or 9 other racers. The peculiarity is that your vehicle changes while you drive, which makes the game more fun and unpredictable. Cars, planes, boats… You never know what is going to be next! To make the game even more entertaining, you can invite your friends and play with them! Up to 3 people are available to compete with online. It is possible to find friends by their Facebook accounts, which considerably facilitates the search. There are different ways of controlling the game – you can both touch and tilt. Sonic & All-Stars Racing Transformed is a superb game. Download it now and have fun competing with friends! Real Racing 3 is so real that racetracks actually exist in reality and all the cars introduced in the game are also from the real world. The game is published by Electronic Arts, which means that if you are a fan of good old Need For Speed, it will also float your boats. Seventeen tracks located in different parts of the Globe and cars from the most distinguished manufacturers such as Audi, Lamborghini, Porsche won’t definitely leave you indifferent! Be ready to free some space on your device, though. Large amounts of content make the game quite heavy. In Real Racing 3 you can go through the levels of career or compete with people from all over the world. So what are you waiting for? Download the game now and dip into the world of real racing! One of the most popular games today is Crossy Road. Crossy Road is a simple arcade game. At first, it seems that there is nothing special about it. All you need to do is to cross numerous endless roads and gain scores for the length of your way. But you will be pleasantly surprised by the fact, that you want to play this game over and over again. Special effects, impeccable graphics and interesting obstacles on the roads make Crossy Road so nice and addictive, that it just cannot bore anyone! There are in-app purchases, but they are quite moderate. So are the ads. The game will serve you as a pleasant time-waster and help your mind distract from everyday worries. Get it now and you’ll certainly enjoy your playing experience! As you might have guessed, Disney Crossy Road is similar to the previous one. The only difference is other characters that are taken from the best cartoons of Disney and Pixar animation. You are able to play with Micky, Donald, Captain Jack Sparrow and so many others! Besides, there are unique obstacles in every world, such as falling barrels or wild animals. So keep your mind sharp and try to overcome each of them! Get the game now and begin your journey through this 8-bit reality with your favorite characters of childhood! Back to the racing games! Big Bang Racing is a lot of fun. There are only one character and two vehicles, but they are enough to make this game super cool! Get through the levels by collecting treasures and other stuff, find all the caps for your character and compete with other racers from all over the world! The number of levels is literally unlimited. You can also create your own ones and share them with others. If you are really into this game, you can gather your team and compete with other teams in Weekly Seasons. Without doubt, interesting graphics is what makes this game so much fun. It is nice to look at and to control. Download Big Bang Racing now and join one of the most exciting races! Dashy Crashy is about not crashing into cars! It is another cool arcade game similar to Crossy Road. All you need to do is to drive on and on, trying not to hit cars on your way. Why is this so exciting? Well, there are two reasons: the mind-blowing effects and excellent graphics. You can control the game by swiping, which is a lot more convenient than tapping. There is also Game Center, which allows you to compete with friends and win their cars. Ain’t it fun? There is also a rewarding system. The longer you go, the more cars you can unlock. So are you ready to go on this endless trip? Then download Dashy Crashy and get started! Enough with the arcade games. Let’s explore something more sophisticated. Clash Royale is a card-based brawler. You need to collect cards with troops, spellings and fortresses in order to win as many battles as you can! The game is extremely popular. There are lots of players, with whom you can fight online. It is also possible to invite your friends and play with them. You can both battle against your friends or be on their side. Create your Clash Royale family and share cards with each other in order to win more battles. There are lots of different rewards like chests full of treasures or cards. The game requires thinking, so there are lots of strategies you can learn from TV Royale, which is specially created for this purpose. Aren’t you eager to enter your first battle? Download the game and enter it right now! Battle Golf is a very simple and enjoyable game. There are two modes. The first one is playing against Al, which is just getting balls in the holes in a limited time. The second one is a multiplayer mode. In this one you can play with a person who is near you by passing the device to each other. The game is a great time-waster. However, there is no rewarding system, so you won’t get any bonuses or cool items like in other games. The simplicity is the key here. Battle Golf is great on its own and, in addition, doesn’t make you too addicted to it. So if you have a couple of spare minutes now and then, this game will help you to make them amusing! Download Battle Golf and enjoy golfing with your friend! While Battle Golf is a simple golf-based game, Super Stickman Golf 3 is a more extended one. Here you don’t just play golf. You get different kinds of bonuses for that! You can collect cards, hats and other items. Besides, every day there is a new challenge for you, which kind of makes you play the game more often. Super Stickman Golf 3 is the third game in the series. The developers have tried to make this version better than previous ones by improving mechanics and adding new cool features. The graphics is diverse, so you won’t get bored by the same standard field. All in all, this one is definitely worth trying, especially if you love playing golf-based games. Download Super Stickman Golf 3 now and happy golfing! Only One is another brawler. The concept of it is the following: you are fighting with others on a field, which is high above the Earth and getting rid of your enemies by killing them or throwing them down (which is pretty much the same here). The goal is to become the only one left on the field. The game is very dynamic. Once you get the sword, which is in the center of the field, different kinds of things start attacking you and there is always something new. As you improve at the game, your level changes, making you fight more and more creatures. Only One is a cool game with great pixel graphics and retro music. If you are a fan of fast-reaction games, get this one right now and challenge yourself to stay the only one! Darkside is a very engaging arcade game, in which your mission is to destroy huge rocks in order to protect space colonies. The story of the game is quite amazing. Sci-fi fans will love it! Spaceships, aliens, asteroids… What else is needed for a good futuristic game anyway? There are one hundred levels, so it will take a while to go through all of them. Amazing 3D graphics makes playing experience even more exciting. Darkside is free to download, but there are two additional modes that you can buy. These modes are like absolutely different games, so it is not necessary to bother with their purchase. Get this game now and go exploring galaxies and fighting aliens! Middle Manager of Justice is a fun game to play. In this one you become a middle manager of justice, which means you hire superheroes and upgrade them in order to protect civilians. The game resembles a simple simulator, in which you accomplish different goals, build objects and so on. Apart from all of that, it is filled with hilarious jokes about superheroes, which makes playing super fun. Middle Manager of Justice is thoroughly developed, which means that every little detail is cute and interesting. The great visuals and strong mechanics definitely contribute to a pleasant impression of the game. If you like sims, try downloading this one and have fun training superheroes! 99 Rockets is one more simple arcade game. There are 99 rockets which you need to launch in order to pop bubbles. Well, the rockets are actually launched automatically, so all you need to do is to tap at the right moment, so that a rocket goes to a bubble. At first, everything seems to be easy, but the difficulty increases with every launched rocket. The graphics is simple, but beautiful. There are only two colors used, so minimalists will surely appreciate the gameplay. 99 Rockets is quite engaging. It can make you spend 2 hours of your time in a row! The free version is fine, but there are some ads. If you want an ad-free version, you can go premium. So get the game now and kill off all the bubbles! illi is a fluffy cute creature. In this game you have to be it and travel through the worlds with different laws of physics, which is the absence of gravity – illi jumps even if it is upside down. Each world is unique and has special obstacles for you to overcome. There are 60 levels and lots of quests. While going through levels, you can collect light crystals to get extra points. Overall, the game seems to be a simple puzzler, but it is quite fascinating. illi makes you totally concentrated on its jumps and portals. Whimsical views and excellent graphics cannot leave anyone indifferent. So download illi and start your journey defying the laws of gravity right now! Dumb ways to die. So many dumb ways to die… If you haven’t watched the video yet, you should definitely check it out. The social add by Metro Trains Melbourn aims to make people act more carefully on the roads by naming a number of other dumb ways to die. The game is based on this video. It consists of 18 little quests, in which you have to escape death. For example, you have to glance quickly at all the doors and choose the one, behind which there is no serial killer. The pace of the game always goes up, which makes it more difficult to stay alive. Fun characters and hilarious situations are what makes this game so cool. Download it now and enjoy! And, of course, remember to be careful in a real life, especially around trains! Land Sliders is one more fun game to play. This one requires you to collect swag for your character and avoid danger in the face of enemies and peculiarities of the landscape. There are a definite number of levels through which you need to go and different characters who want different kinds of swag. The graphics is very nice. Colors are bright, which makes playing even more joyful. Every level surprises a player with something new and exciting. You can turn up in a desert, in a snowy cave or in a green field. Land Sliders is a great time-killer! Get it now and collect all the swag for the game’s characters! Mekorama is a nice puzzle game. It consists of 50 levels and the ultimate goal of it is to bring a lost robot home. Levels are presented in the form of dioramas, which a player can view from any side he likes. At first, playing seems to be easy, but situations are getting more and more complicated with every challenge. If you manage to complete all the game tasks, you can create your own levels or play the ones that are created by other players. Mekorama has got all 5 stars in App Store. People love this game and want the cute lost robot to become a hero in animation. Download the game now and find out what all the fuss is about! Lunar Flowers is a relaxing and atmospheric game. Pleasant graphics, nice music and slow motion make you feel calm and peaceful. This one is probably best to play before sleep. In Lunar Flowers you play as a princess who wanders in a magical world at night and goes through different challenges. Challenges are various. To give an example, the first one is floating in a boat by connecting flowers in the right order. The game is like a journey through a magical world. The fun part of it is that you never know what is going to be next. If you are a fan of beautiful animation, download this one! You won’t simply want to put your device down! Fast like a Fox is a fun arcade game, in which you go through levels by running and collecting coins, emeralds and so on. Here you have to get used to an interesting control system – run by tapping the back of your device and jump by tapping the front. The game gets faster and faster with time. It is a really fun one. The background changes, which makes it even more exciting to get through the levels. For example, you can turn up in snowy valleys, city highways or mountain peaks. There are also an appropriate music and cool sounds. You can compare your results with other players by viewing the leadership board. Who knows? Maybe you’ll be the best! Download this exciting game now and become fast like a fox! Temple Run 2 is a sequel to the beloved adventurous game. In case you don’t know what is it about – it is about running! A brave character runs from a monster and collects coins and other useful stuff on the way. A player has to escape obstacles by jumping, sliding or turning left or right. The new version boasts with its improved graphics, new environments and achievements. There is so much to explore and unlock in this game! Earn coins and buy new characters, get through levels and enjoy new exciting views. The mysterious story, which lays behind all this running, will certainly appeal to anyone. Download temple Run 2 right now and begin your adventurous journey through this thrilling game! Cally’s Caves 3 is another fun and simple game. In this one you do not only have to run, but also fight your enemies with different kinds of weapons. The story goes like this: parents of little cutie Cally were kidnapped and evil genius is trying to take control of the caves. Cally has nothing left to do, but to protect the caves and rescue parents. Help this poor thing! 120 exciting levels filled with malicious enemies and accompanied by cool music. 12 weapon classes and unique abilities you get to unlock. All of that is waiting for you in this fantastic game! Enjoy nice pixel graphics and dynamic gameplay! The game is free with in-app purchases. If you like, you can buy two additional modes. Download Cally’s Caves 3 now and save the girl’s parents! Snakebird is a puzzle game, in which you need to feed birds by changing their shape, so that they won’t fall, touch something spiky or die any other way. Get pieces of fruit by moving a bird up, down, left or right. It seems quite easy, but the game really makes you think hard about situations. When a bird eats a piece of fruit, it becomes longer and looks more like a snake rather than a bird. So, snakebirds are extremely nice and funny. The graphics is bright and colorful. All of that is provided with a relaxing tune and nice sounds. The game will absolutely brighten up your mood! There are lots of difficulty levels. You start with one snakebird and then get to the point when there are 3 of them! Download this wonderful game and kill your time with pleasure! Lost Tracks is a wonderful game created by students from the Animation Workshop as their graduation project. The game is about a shy boy in his twenties who is afraid of talking to a girl he likes at the railway station. As he looks at the girl, he gets lost in his mind, when there are lots of missions for you to accomplish. In the game, the guy has to run from one regulator to another in order to mend those things and make the train go. Controls are the following: you do most things by tapping, but run by tilting. It might be hard to get used to at first. How many of us try to escape reality sometimes? This game is a sheer piece of art with a nice idea and pleasant animation. Get it now and enjoy the atmosphere! Whale Trail is one more colorful game with excellent graphics and a nice song in the background. This one makes you play as a little whale who flies in the sky and collects bubbles and tiny friends to go along with. When it does so, the challenge is to avoid dark clouds scattered all around the way. Whale Trail was published in 2011, however it still has its fans and gets updated from time to time. No surprises here – the game is just gorgeous! There are two modes and 96 levels. You can complete every level with the maximum of 3 stars. The developers of the game must have worked really hard on it, which can be proved by the fact that it is still popular. Get this one now and collect all the whale’s friends! Smash Hit is an unusual arcade game. It transfers you to a bizarre reality with lots of glasses that you have to break by throwing metallic balls at them. The mechanics is great and glass-breaking looks very natural. So if you are stressed-out, you may try releasing tension in this surrealistic world! Although, as you improve the game becomes more and more difficult, making you break flying glasses or glasses that appear on your way extremely fast! The patience is certainly required here. Smash Hit has a number of interesting tracks to accompany your journey through the glass world. The graphics is just awesome. Download the game now and enjoy! Mr Dig is one more cool puzzle game. In this one you play as an adventurer and treasure hunter Mr Dig. Mr Dig loves digging! Once he encountered monsters underground and they stole all of his food and gems. Your aim is to help the adventurer return his stuff by going through 50 fancy levels. Each level is full of items to collect and obstacles on the way to these items. A player can dig down, right or left and use special ways to destroy obstacles. Sometimes there are monsters that have to be destroyed! The game has a pixel graphics and cool sounds. Download Mr Dig now and have a fun digging! Hue Ball is an addictive tap-to-shoot game, in which you have to tap at the right moment in order to destroy balls by throwing at them one more ball. The cannon, from which you shoot, is constantly moving, which makes it more difficult to be precise. Besides, there is a big circle behind the balls, which is shrinking all the time. When it disappears, the balls get a new layer and become harder to kill off. There are no levels in this game. You just play till you die or till the screen fills with balls that are impossible to get rid of. Such balls look like skeletons. So, the aim is to be able to play as long as you can and get the highest score. Simple design and engaging gameplay make you play this game over and over again. Download it now and have fun! Fold the World is a great puzzle game. This one takes place in a magical paper world, where a player has to fold the paper in order to get a creature named Yolo to the entrance of the next level. Games by Crazy Labs are always beautifully designed and this one is not an exception. Every detail of the paper world is elaborated and the whole game looks amazing! In addition, you will be pleasantly surprised by funny sounds all of your moves are followed by. Another nice feature is a storytelling – every time you get through a level, you get to read an excerpt of a fairytale. What a nice bonus for kids! Download this whimsical game right now and start to fold the world! Zen Pinball is one of the best Pinball games for iOS. It is developed by Zen Studios, which was one of the first to start making digital pinball games. Surely, everybody knows how to play pinball! In this game, playing pinball is even more fun, as there is a number of beautiful tables, that please your eyes. The design of some tables is based on the biggest entertainment brands, such as Marvel, Star Wars, The Walking Dead and so on. Amazing 3D graphics contribute to a nice playing experience. So does the realistic mechanics. There are a leadership board and an opportunity to compete with friends. If you are a fan of pinball games, you’ll definitely enjoy this one! Download it now and have fun! Magnetic Billiards: Blueprint is one more puzzle game. It won lots of rewards back in 2011 and still remains one of the best digital puzzles ever created. The gameplay consists of a table, on which there are circles of different colors. The aim of a player is to connect circles of the same color, so that they will disappear together. Now this is the easiest part. The tricky one is that you need to earn as many scores as possible by taking risks and working out new complicated strategies. Magnetic Billiards is extremely addictive. There are only about 20 tables to unlock, but the number of strategies is unlimited! Download this game now and use your imagination to get all the A’s! 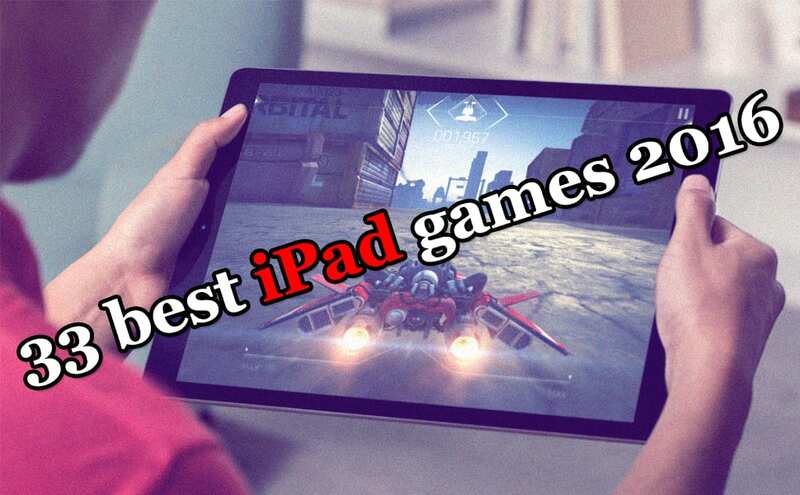 So, we have reviewed 33 cool free iPad games. Are your favorite ones on the list? If not, share them with us! Enjoy possibilities of your bigger screen to the full and have fun playing the most awesome iPad games!